After recently reading my friend Oz’s post in her blog – ‘kitchen butterfly.com’ on shifting base from one place to another, I co-related with the pains of leaving friends behind and the agonies related to packing. I know the pains of packing. But I have felt an explorer’s enthusiasm while shifting to a new place but ‘getting your children married’ kind of a tension while leaving the old. Yet the blankness in mind and heart, having left your near and dear ones until you reach the new destination is quite stressful. Happy Settling!! But never thought mine was so very close. So, here I am.. in another packing – having packed – unsettled phase… the only difference from recent previous packings is that we are back home. Home, not meaning home state where I belong, but nearly 2200 kms from home but yet in home country. One suddenly seems to be squeezed between the never ending packing (which I used to like, not anymore), and telling bye to dear friends, formal associates and those special souls who became close to the heart pals. It is a very difficult phase, where everything seems unsettled till your own things reach back to the new place of livelihood. It is again a tedious process of unpacking, but at least you know you are settling yourself in the new place, in Oz’s words – ‘Unpacking a House to Home’… I like the phrase and want it soon. While leaving behind people and memories is a pain, the effect is obviously more on the children. We don’t realize what they have left behind in their eyes. The pressure of completing the incomplete school year, leaving friends and teachers and their playmates, landing in a new place, finding new friends, getting accustomed to new environment and getting placed well in a new school, the biggest of all might be being accepted in the new whatever groups they might be sent to…. the list might grow longer. So, to simplify, just say ‘IT IS DIFFICULT’. Now, I do not intend going into what I left behind in Cambodia, the country which had become very much connected to heart and soul, due to the ancient connections with Tamilnadu. But as a foodie, I truly miss the flavors of Khmer Cuisine, which was in an amateur path of exploration. So, I decided to rekindle those memorable moments of learning Khmer sweets, soups and curries. A true big thanks to my friends ‘D’ and ‘S’, who were wonderful teachers in showing the art of Khmer Cooking… patiently… step by step. 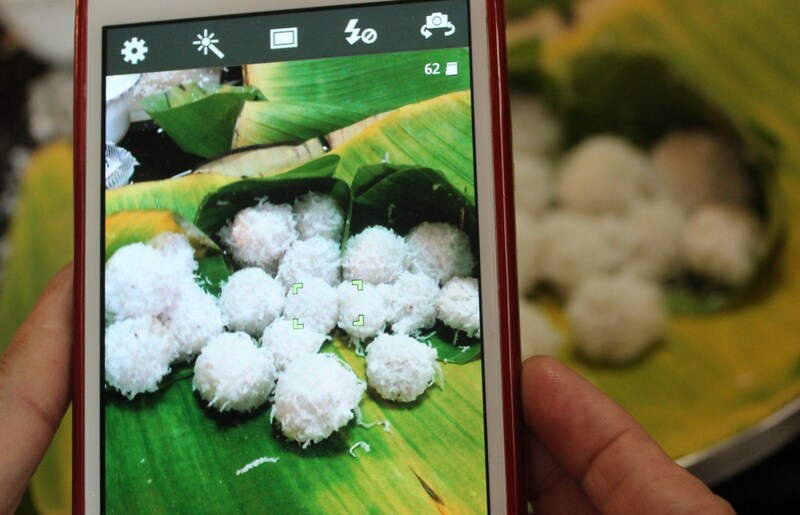 ‘Num Plae Ai’ is a very simple yet delicious sweet treat. Again rice based and Palm Sugar, the ingredients are limited, method simple but the end result too good. 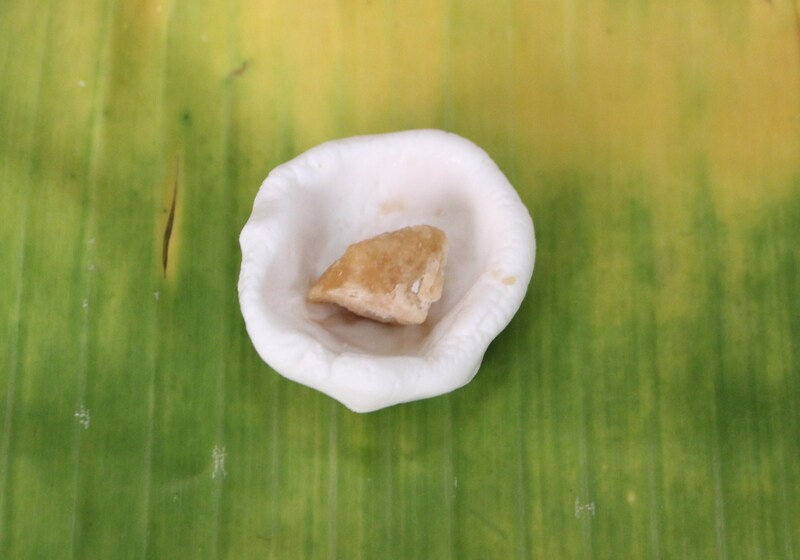 The sticky rice outer covering is a bit chewy, and the dissolved palm sugar candy inside makes its own path inside leaving a sweet flavor. After reading a few other blogs, I understand this is also colloquially called ‘kill husband cake’ as it was made by a betrayed wife to revenge her husband. The chewy and slippery outer covering is believed to have stuck in his throat. But, beyond betrayals and revenges, Num Plae Ai is truly a sugar lover’s delight. 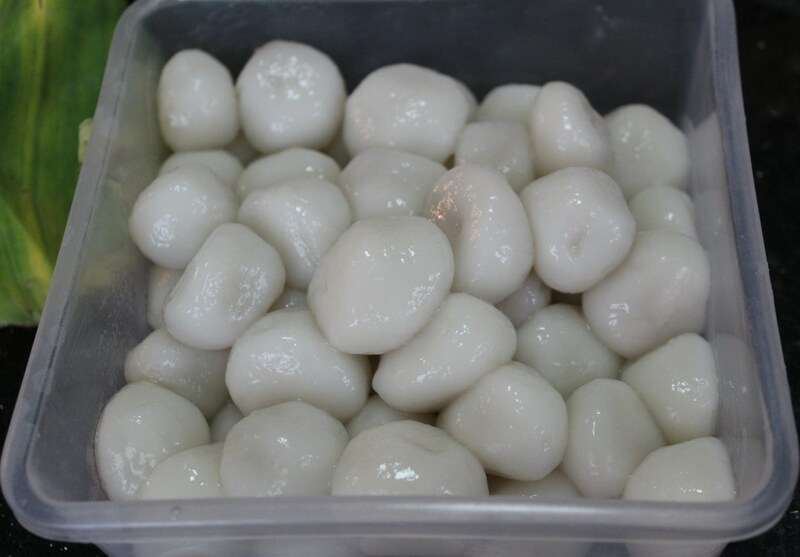 I made this sweet with 500 gms sticky rice flour and I think I got nearly 50 sweet balls. Just decide how much you’d need. By this ratio, 1 cup measuring 200 gms might yield 15-20 approximately. Regrets on any flaws in mathematics. 1. 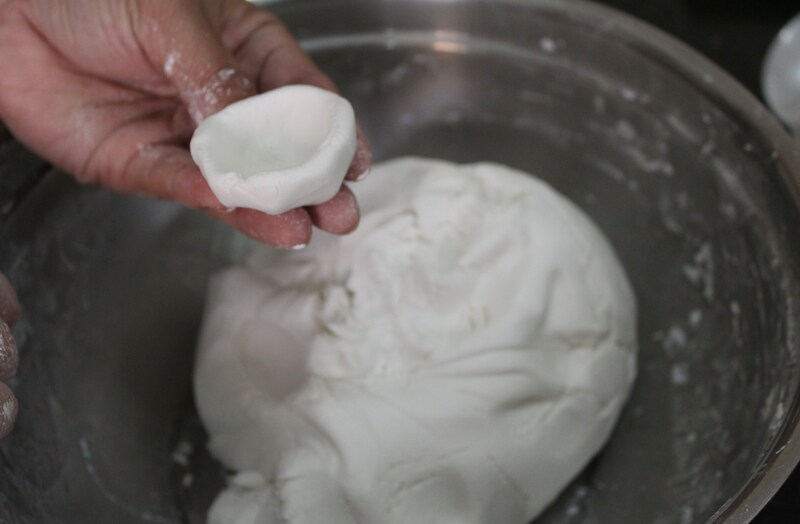 Mix rice flour with a pinch of salt and water (normal temperature). 2. 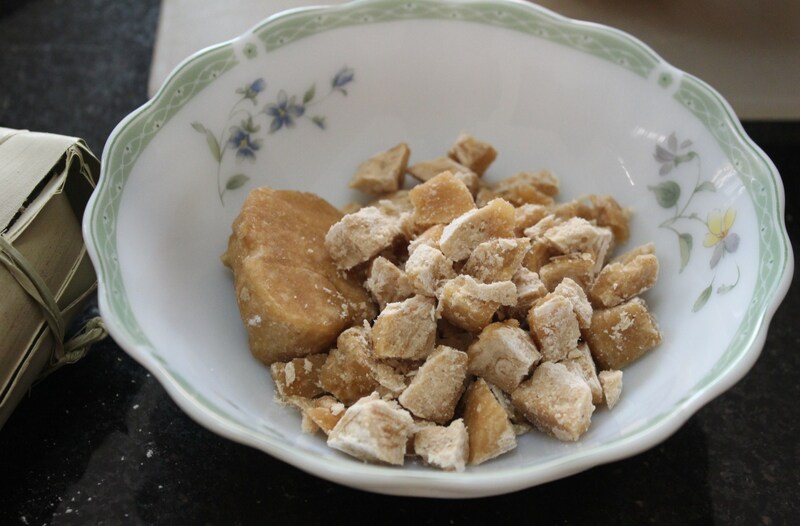 Cut the Palm Jaggery into small pieces to fill one piece into each ball. 3. Grate coconut and keep aside. Can be kept in fridge and taken out in the end as grated coconut is needed only in the end of making the sweet and might stay fresh refrigerated. 5. 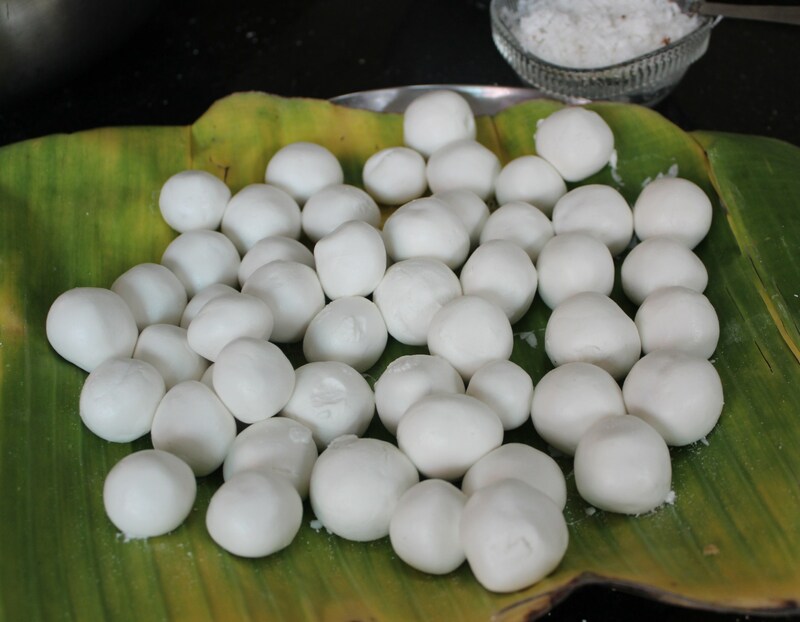 Fill each ball with one piece of cut jaggery and close. 6. 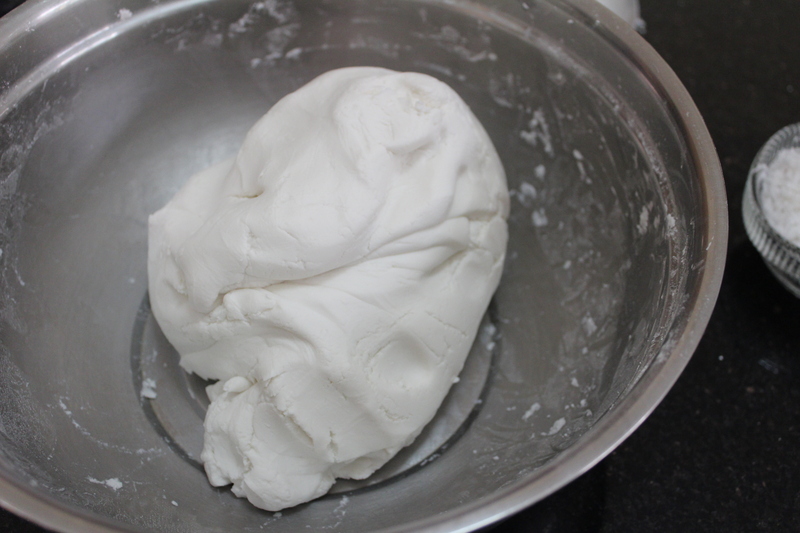 Make the same with all the rice flour. 7. 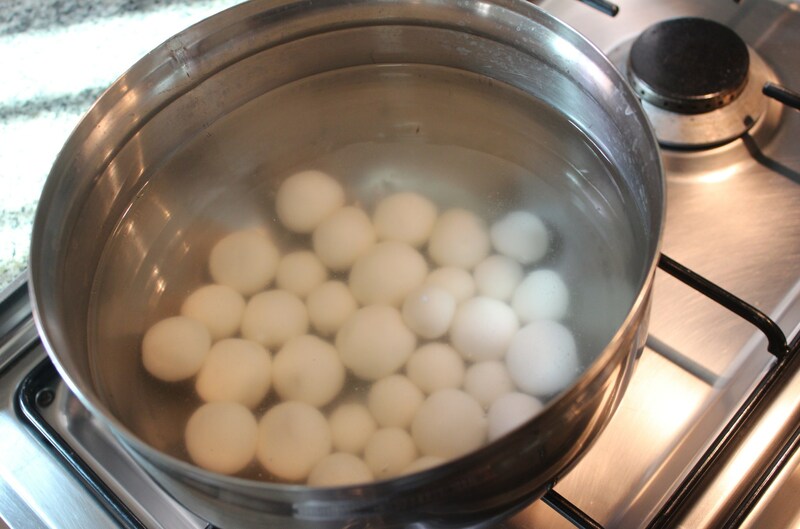 Boil water in medium flame, in a big bowl or any big hard bottomed vessel with a pinch of salt. 8. Simmer and gently drop the palm jaggery filled rice balls into it; Keep flame in minimum position. 9. 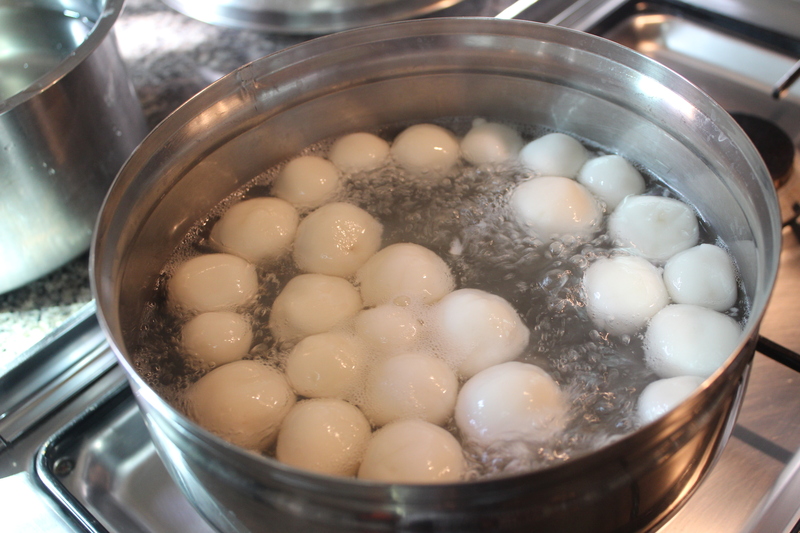 The sweet balls which are at the bottom of the vessel when dropped, rise up to the water level after cooked. This cooking process might take 5 to 10 minutes. 10. 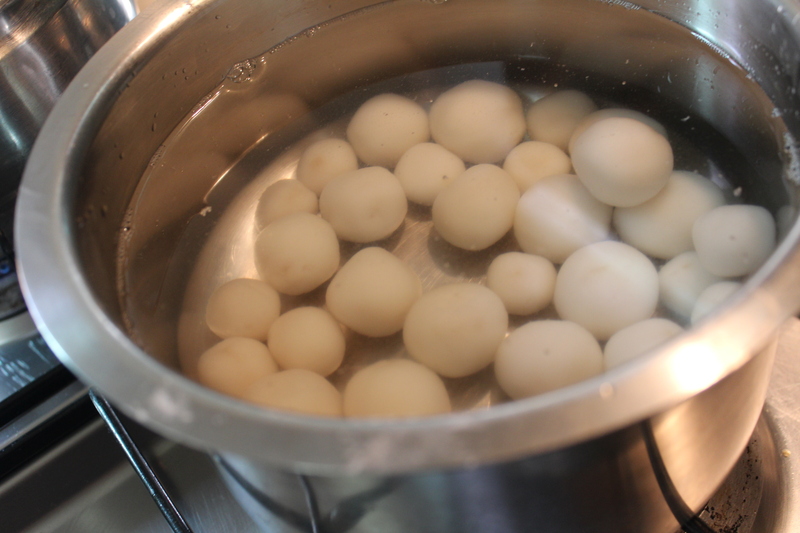 Take a bowl of room temperature water or cold water and drop the cooked sweet balls inside. 11. Cook them in batches. 12. After a minute, remove them and place in a plate. 13. 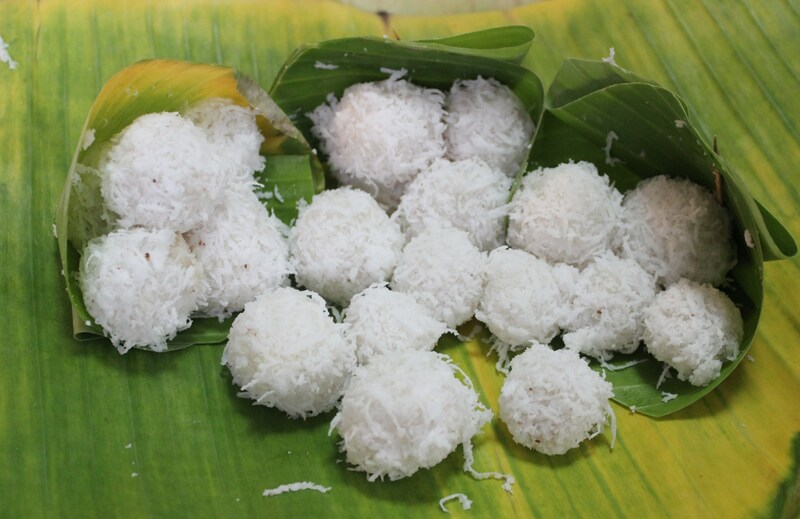 Take the grated coconut and spread in a plate and roll each sweet in grated coconut to make a covering. This is generally served in a banana leaf cone with a tooth pick in the markets in Phnom Penh. The sticky rice balls can be stored in refrigerator for a couple of days or even more. If one prefers to freeze, do not add coconut topping. 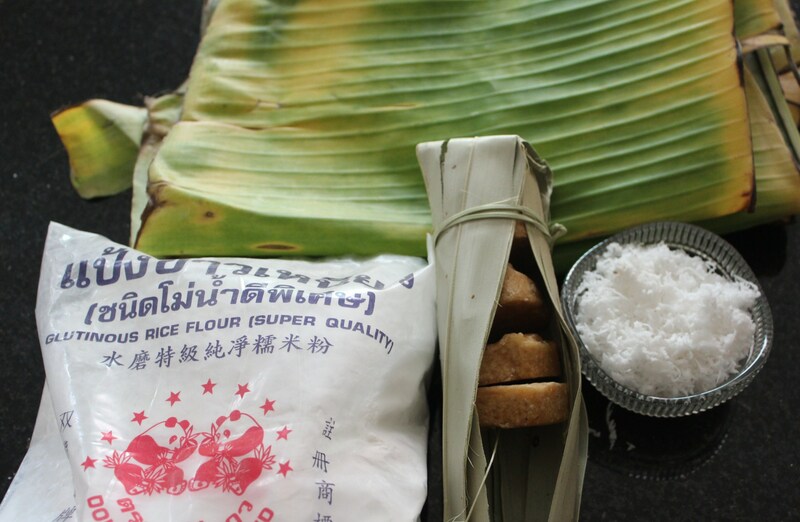 Thaw frozen Plae Ai when needed, steam to make them fresh and roll in grated coconut to serve. Next Post A perfect birthday present from the past!! Haven’t visited your blog for quite a while…Lo! you made me crave for those delicious Khmer modaks… I have never tried them, always used to buy them in PP. Thanks for the step by step recipe; should try them soon. Happy cooking and blogging, friend! Thanks dear. 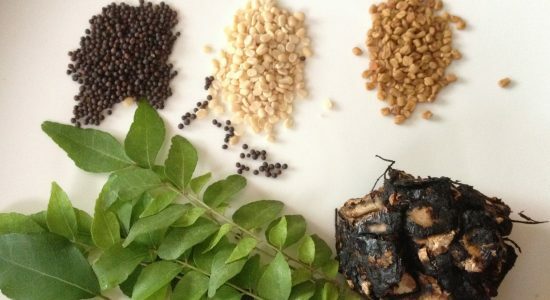 Khmer delicacies are such a delight to cook as well to relish. This is one of the easier sweets.. a few others involve a lot of work.